I made cake pops to take to my son's class for his 9th birthday. 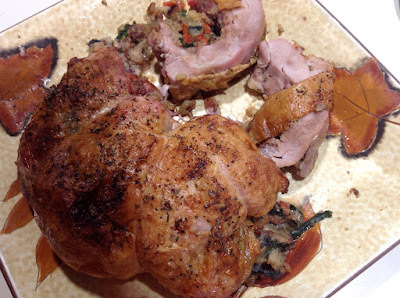 I had never made them before but we had tasted them and both liked them so I gave it a try. Rather messy mixing and shaping, but they turned out really cute. It is my own design. Some of the kids thought they were "angry birds" which I had never heard of so that isn't what they were intended to be. I told them they were "friendly" birds. The tail and beak are candy corns and the eyes were premade sugar candy eyes. The kids were almost afraid to eat them and some wanted to take them home to show their moms. They all ended up eating them though and they were very well liked. Once again a costume was required for the now 9-year old son. My usual MO is to search the house for items that can be "adapted" instead of starting from scratch for a costume. This year I laid eyes on the long stuffed tube I had made for my son a number of years ago to wrap into a coil and sit in or lean against. I quickly stitched up a head and tail to stuff and attach to the ends of the already made stuffed tube. I put eyes and a forked tongue (maybe not truly python-like, but a hit with the 9-year old) on it and made a python. I attached the head part to an old adult size t-shirt so it would be positioned over his shoulder and I wouldn't have to pin it every time he put it on. We wrapped the body around him and strapped coils up by wrapping them with ties that went over his shoulders. I put a "safari" hat on him and a pair of toy binoculars and he was transformed into a National Geographic explorer having a bad day! The costume was a hit! It did require a number of gyrations for both of us to get it off and on him each time, but once he had it on there didn't seem to be any problems for him and actually in the trick-or-treating crowds it acted as a sort of bumper protecting him from harm!! Although I spend a lot of time making sure my art pieces are well made and sturdy, when I make a costume I use large stitches and safety pins, and I don't worry much about raw edges and other imperfections. It is only for a couple of days of wear so for me comfort is the key requirement, not quality. A good idea creatively executed that the kid will wear without complaint is a success! We went to a neighborhood where there must have been hundreds of kids trick-or-treating because most of the houses decorate and prepare for the masses (although we were late getting started and many ran out before we got there and had their lights off already!). One house we went to told my son that his was the best costume she had seen all night and had to bring her son to the door to show him. He had lots of other comments about his costume which wasn't surprising since the crowds are full of ninjas and witches and other purchased costumes so anything homemade is unique. Another successful Halloween and a happy 9-year old trick-or-treater! "Geometric Forest" - From a recent TARTs kit that involved using rayon thread to create design features. Not my usual color palette or design style, but I like it. Information on TARTs projects and lessons can be found on In Good Company's blog--see my list of links. Opening day of rifle hunting season is tomorrow (Saturday). That means the boys are off doing their thing and I'm home doing mine. Plenty of time to work on my art and not worry about meals, dishes, housework and that kind of creativity squelching stuff! And I can turn the heat up when I want to! I'm currently working on a piece using one of my recently created soy wax batik fabrics along with some hand-dyed fabrics and batiks. The colorway is pink to dark red with some gold and a touch of blue. With the rainy days we've had I haven't been inspired to take any pictures because the lighting is so dim, but I will get some on here soon! The soy wax batik class I took last month was very fun and I came out with some wonderful fabrics to use in my work. I tried to get a nice variety and think I succeeded. I think they are all usable and will add a lot to my work. Thanks goes to the women of In Good Company of Hamilton, Montana for holding this class and providing the myriad of colors of fabric paint and piles of mark-making tools! I would not do this at home because of the space it takes and mess it makes so I was happy to get to take the class and not worry about that. Back to sewing. Need to get the binding and then beading done on this pink piece I'm working on! For Sale, For Show, SOLD! Since the last post was so WORDY, I thought I'd give you some pictures! 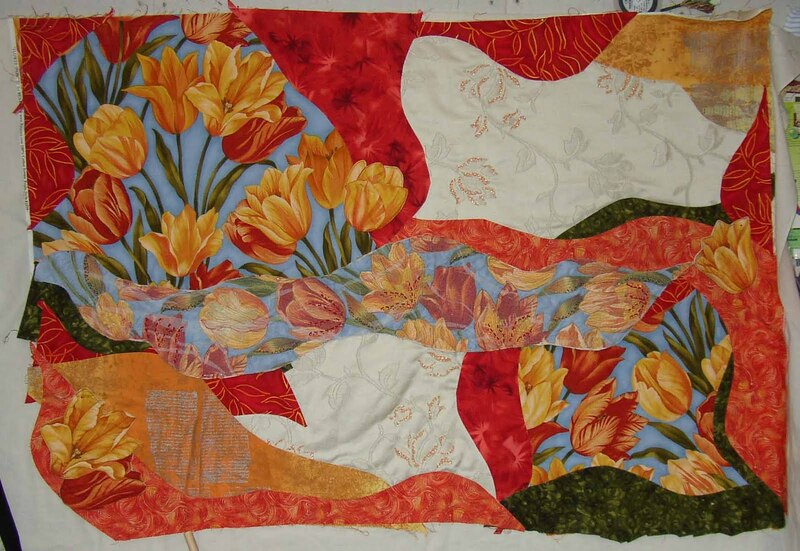 The first one is currently getting ready for judging at Machine Quilting Exposition (MQX) - West in Portland, Oregon. It is called "Go Where It Takes You" and is 18"w x 21"h and priced at $280.00. It was created for a challenge requiring us to use the grey/blue oriental fabric and the white background fabric (which actually has a touch of light purple but very subtle). Next is a little piece I made a while back that has not sold but is definitely worthy. My local gallery, River's Mist, is hanging this months show tomorrow and if she isn't able to fit this piece in, I will likely take it to The Artist's Shop or Art City. Price is $85.00 and the piece is 8"x14". It is called simply, "Abstract Triangles". This last one is called "Oxygen" because that is what it told me to call it! It has fabric leaves hanging from bead dangles and is one of my favorite little pieces. It is only 8-1/2"w x 25"h but has nice impact because of the light background and great color--and leaves of course! The fabric that inspired the piece was from Selvedge Studio in Missoula, Montana. Not the first time one of their fabrics has inspired something for me! Price is $110.00, but this piece just sold at The Artist's Shop bringing my total number of pieces sold in my solo show there to 8 (as of Saturday)! Have been busy with show entries, son's birthday, and such, so anxious to get back into the studio so I can show you something new! By the way, the piece I blogged about recently that I made for the Trout Unlimited fundraising auction sold for a disappointing $100.00. They started bidding at $25 which was rather low in my view as I had valued the piece at $450.00 and if I had put it in a gallery likely would have put a price over $500.00 on it. But, hopefully whoever got the piece will enjoy it and appreciate it. It is a lovely inspired piece. Wish I could have enjoyed it myself a little longer! My solo exhibition at The Artist's Shop in Missoula, Montana will be taken down on Wednesday this week (October 5). I have now sold 7 pieces there and am very happy with the success of the show. It has been well received and I've had lots of wonderful comments about my work. Please stop in and see the show if you are in Missoula--and sign my guestbook! I do not have any other shows booked in the area until next spring. In February I will participate in the annual fiber art show in Hamilton, "An Affair of the heART" sponsored by In Good Company. There are many fiber artists in the Missoula/Bitterroot area that participate in this and it is always a wonderful show. I will be curating a show in Stevensville, Montana (River's Mist Gallery) in April, 2012, that will focus on fiber of different types including clothing, weaving, quilting, and whatever else I might find in the next few months to feature in the show. I haven't worked out the parameters of this show yet but I am currently keeping an eye out for artists to include in the mix. I just sent three pieces to Portland for the juried Machine Quilting Exposition West. If you are going to Houston for Quilt Festival look for my piece, "Glorious Leaves" in the SAQA Sense of Adventure special exhibit, which will also travel to the other IQF shows and to the Gerald Ford Museum. As always I am waiting to hear from a couple of shows as to whether my work has been accepted or not and I am getting ready to fill out a couple more show entries. It is never ending! Hopefully one of my pieces will be in a venue near you sometime soon! August is almost over and so is the family art show at River's Mist Gallery. It was a nice show and lots of people came to see it, but not too many sales. I sold two small pieces, my mom sold one, my sister sold one (to my mom! ), and my son sold 6. It would have been nice if everyone would have sold something, but I guess it just isn't too be! The show will be up until Tuesday next week (August 30) so you have a couple of days to see it if you are in the area. Opening Reception: First Friday, September 2, from 5pm-8pm. I've got some brand new work for this show so please come and see it! Once I get this show hung I will be working on a piece for the Trout Unlimited Banquet auction fundraiser later in September. I have been sketching out some ideas and thinking about this for some time now. I'm leaning towards a representation of a stream with shadowy fish swimming through it. I would include either cutouts or sheers for the construction. Another idea I had would incorporate the swooping line of a fly rod with a fly on the end. I love the gentle looping back and forth of the line and the graceful arch that allows the fly to drop gently on the surface of the water. This might also include the rings of water moving outward from the point where the fly lands---quilted in of course. As soon as I get this next show off and running I'll get to work on this piece and decide exactly what I'm going to do. Still thinking....! I have two pieces in the Pacific West Quilt Show this weekend and just sent one quilt to the SAQA Sense of Adventure exhibition which will premier at International Quilt Festival in Houston. I'm waiting to hear from a couple of shows that I sent entries to and I'm going to be submitting a couple more entries in the next week or two. Keeping my work out there is a challenge---an expensive one. It would be helpful if I would win an award or two and get some funds to help with the entry fees and shipping costs for all these shows. I'm honored to be accepted to them, but it all adds up. The sales I have made in the last few months have all been small pieces. I'm grateful that, unlike many artists, I'm selling work on a regular basis, but the small pieces just don't get me too far! The first is called "Tulip Skies", and the second image is one that I believe I published on this blog in October of 2008 when I was initially working on this piece! I had met with irreconcilable difficulties and wasn't able to move forward with it at that time. When I pulled it out a few months ago I was able to work through the design issues and finish the piece for my August family show! It has received lots of positive comments and is a very bold and dramatic piece. This next one is called "Tapestry Strutting". I used a small section of pin weaving that I had made over a year ago to create the body of the pheasant. I challenged my family members to all create a pheasant piece of some sort. Four of us participated and it was a beautiful display. The sculptural effect of the quilting over the pin weaving was very successful. When I am trying to determine what is going to be my next project I have several ways of triggering ideas. Most often I go to my fabric stash and look for that certain fabric that will inspire an entire piece. Once I even built a quilt around a fabric and then eliminated that fabric because it didn't work well in the final design! Choosing the fabrics from my stash to go with the inspiration fabric is one of my favorite parts of the whole process! Another way to figure out what to do next is to look in my sketchbooks and see what ideas I have had that I've probably forgotten. Everytime I look through my books I see the value of making little sketches or notes about ideas that pop into your head at odd times. The recording of those thoughts is a great jumping off point and many of my pieces have started there. A third way I trigger ideas is by looking at my design wall where I often pin up unusual items I have acquired---a piece of beaded trim, some dyed gauze, a hank of nubby hand-dyed yarn, or a new strand of particularly stunning beads. The reason I put them there was so they would be in the forefront and not forgotten when I am looking for ideas. Sometimes unusual combinations arise because of what happens to be pinned up next to what. The trick for this technique is not to cover up so much of your design wall that you can't work on it! In a previous post I showed you some detail images of two pieces I was working on. One was inspired by the simple idea to quilt with white thread on black fabric, and the other was inspired by the round copper beads that are dangling at the bottom. Neither of these are masterpieces, but interesting I think. They are both going to be in the show opening on Friday. One more way I get inspiration for a design is from a technique I'm playing around with. The quilt below is one that arose from a fabric weaving technique my mom showed me using those wonderful ombre fabrics that fade from one color to another or from light to dark. You never know where your next quilt idea will come from. Keep a sketchbook for those ideas that come when you aren't ready for them yet. Keep some key items out where you can see them to help trigger that next design idea. Run your fingers through your stash once in a while to see what gorgeous fabric you had forgotten you bought knowing it would be just perfect for building a showpiece around! Then get in your studio/sewing room and design that fiber art!! 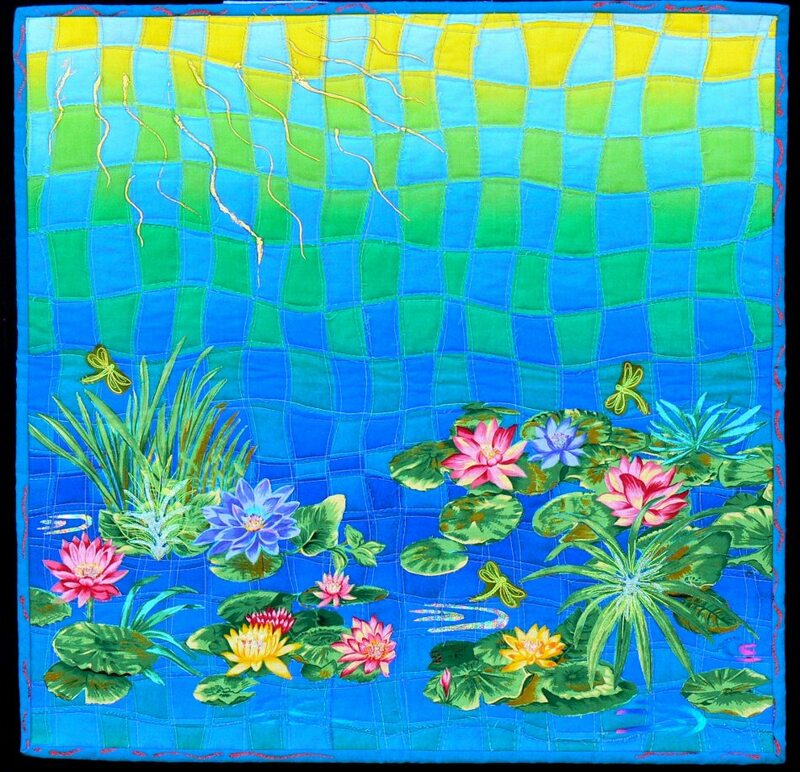 I love to embellish my art quilts with all kinds of things. I most often use beads but I use more than the usual seed beads and bugle beads. I love to combine stone, glass, and metal beads with the fiber because they compliment it so well and add great texture. Here is a piece that I made recently which is currently hanging in my solo exhibition at Art City Gallery in Hamilton, Montana. The piece is called "Indian Summer" and the dangling leaves at the bottom are made with shrink plastic. I colored the plastic with Sharpie markers, punched a hole in the top of each leaf, cut them out, and shrunk them on a baking sheet covered with foil in the oven. They are strung from the quilt on beaded strands and when they happen to knock together they make a very nice sound. The color is vivid and permanent (a little difficult to see on the detail picture because they are shiny and reflective). A very fun and easy embellishment. Shrink plastic (yes, the same as those Shrinky Dinks you used to make when you were a kid! ), is available at Joann's and probably lots of other places. The hanging cord is a strip of suede and the rod is a stick I found early this spring when I was out hunting for morels along a stream. Another piece I made recently (also in my Art City show), uses little butterflies purchased from a local drugstore that has a craft section. They are made from feathers that are painted to look like butterfly wings. I glued them onto the quilt using E6000 adhesive. They are somewhat fragile, but isn't it amazing how well they match the fabric they are perched on? It was purely by accident that I had picked them up just a few days before making this quilt. I did not buy them for anything in particular, just liked the colors. I made the quilt and only then remembered the butterflies and wondered if they would go with it. Serendipity! You never know where an embellishment or an idea for an embellishment might come from. The quilt I am currently working on is a pheasant and I went outside to pick some tall grasses so I could lay them out on the quilt, position them attractively, mark the placement with chalk, and quilt them into the quilt. Worked great! And I had them there next to me so I could quilt the tops of the grasses fairly realistically. I am finishing two pieces up for my family show that will open on Friday, August 5 at River's Mist Gallery in Stevensville, Montana. I gave the gallery several collaged images for the postcard and I think the one below is the one they used. You can see there will be a nice variety of art in our show, although my sister wasn't able to get me images of her wearable art for the postcard. Anyone in the area is invited to attend the opening reception Friday evening from 6-9pm, or visit the gallery anytime in the month of August. I just finished a very small piece inspired by some round copper beads that I just recently purchased. They are dangling at the bottom of the piece. I used copper thread for some of the quilting and an interesting long skinny copper bead as well to carry through the copper inspiration. Not my best work but an interesting little piece. I recently experimented with Artist Transfer Paper and the following quilt utilized an image that I colored onto the transfer paper with regular Sharpie markers. I would not usually use these on fabric since they tend to spread and you cannot do this small detail that I was able to do on the transfer paper. I also used some pastel crayons for some of the color and they also worked well. You can paint, draw, stamp, print, almost anything onto this paper and then transfer it to fabric or almost anything else. It is really fun stuff to experiment with. Here are some detail images of the current piece I am working on. It has a section of nearly black fabric that I am quilting on with white rayon threadwork. I will likely do some beading here as well. As you can see, I am still busy getting ready for my next shows opening in August and September! At the end of last week I picked up a piece that I had worked on more than a year ago and never was able to get it to come together. I wasn't sure if I could even salvage it or at the very least would have to do a major re-work, and I just wasn't at a point where I was ready to do that. So, now when I picked it up again and looked at what I had done I thought it had great potential. Gorgeous color, bold and textural fabrics, interesting lines. It was actually ready for quilting so I tackled it and spent three days quilting my head off (father and son were off hiking the hills and left me home with my passion!). I had made some dimensional attachments for the piece and I reworked some and created more and pinned them on. Then I hung the piece on my design wall. I left the room and came back----voila! It works. I really like it and every time I turn around and see it hanging there I like it more. I just love it when a plan comes together! Now I have a great piece for my August show at River's Mist Gallery and if I can figure out how to attach the dimensional pieces and finish off the edges of the quilt it will be ready to hang. I think it will be a show-stopper! Lesson learned: Sometimes a piece that isn't working just needs to be put away for a while until you are ready to see where it is supposed to go and what it is to become. What I thought wasn't working about this piece turns out to be the best feature of it. Areas of hot clear color and of soft romantic pastel become the hotspots and the eye relief for the piece. The juxtaposition of the different styles/colorways turns out to be interesting and intriguing to the eye. I guess I should have trusted my instincts in putting these together. We'll see if others agree with my feelings about this piece when they see it in August. Now that the piece is almost done I wish I had documented the progress with some images, but alas I did not. I will share some images of the piece in the near future but I want to keep it a bit under wraps until my show. I'm kind of hoping this piece does not sell right away as it has some potential for getting into some shows (but my gallery owner doesn't want to hear that!). I guess I'll just have to wait and see. Finally summer has arrived here in Montana. We had a very wet spring and there is still lots of snow in the mountains. Now it is melting off and causing streams and rivers to run very swift and high. My husband and son are backpacking this weekend near one of these swollen streams so I'm hoping they are staying safe and dry. I have been busy helping with the Bitterroot Quilters' Guild Quilt Show in Hamilton. I helped hang the postcard challenge yesterday and then counted viewer's choice ballots today. Tomorrow I will help man the Silent Auction area. I donated three pieces to the auction and hope that whoever gets them will enjoy them. It is one way that those who can't usually afford my pieces can get them for a reasonable price---not that my prices aren't "reasonable"!! I stopped by the Art City Gallery to see how my solo show was doing and saw that one more piece has sold so I was very happy about that. The gentleman manning the gallery this afternoon said that a woman who was just in was admiring one particular piece and hoping her husband might buy it for her for her birthday or something. Those comments rarely come to fruition, but at least there are people interested in the work and enjoying it. I hope to sell at least a couple more pieces before the show ends July 31. I heard today that the Missoulian newspaper hopes to do a story in the July First Friday arts and entertainment section about our Trunk Show at Montana Art and Framing. That will be great publicity for us and maybe we'll get a good crowd at the First Friday reception that month. I was really hoping that the newspaper would discover the show and write up something about it. I hope they get some good photos. Can't wait to see the story! Two of my pieces were just accepted to the Pacific West Quilt Show in Tacoma, Washington which is 8/26-28. I also had a piece just accepted to the Northern National Quilt Competition in Wisconsin which is a fine art show--my first. I guess this area of Wisconsin has lots of cottages where people from Chicago and Milwaukee go to vacation. This is the 24th show so it is well established and hopefully well attended. They have some cash prizes, but I would like to sell my piece and I haven't really heard how well they sell from this show. It gets to be very costly entering all these shows, so winning or selling something and getting a cash award is very helpful. As soon as the quilt show is over tomorrow I'll be getting started on a new piece. I have some fabrics up on the design wall but I'm not feeling very excited about them so might move to something else. I have a lovely piece of hand-dyed fabric with a manipulated digital image that I transferred onto it using TAP (Transfer Artist Paper) and it is very interesting. I have already chosen some fabrics and been pondering how to proceed with this piece. There is a great deal of detail in the photo image and I'm thinking that threadwork might distract from the wonderful image so I might end up doing some simplistic stitching in that area with monofilament or at least a thread that really blends with the background. Haven't figured out anything as far as the design yet, but I'm thinking that as soon as the quilt show is done my head will be freed up for some more creative thinking! Speaking of the quilt show, it is a wonderful one. There are extremely talented and skilled quilters in the Bitterroot Valley of all types from traditional to innovative to art quilters. Our featured quilter is Jeanne Doyle who is 86 and does beautiful traditional and innovative pieces with great skill and wonderful color sense. I probably enjoyed her exhibit more than any other featured quilter I have ever seen. Wonderful work. There are also many other great quilts in the show and voting was a real challenge---for me and many others. It is a privilege to be a part of this guild. I just looked out to the south west and the sky is blue, purple, pink and slightly orange with streaks of clouds. Then out the other window is my garden bursting with huge orange poppies in full bloom. I love living where we do and being able to enjoy the Rocky Mountains out my front window and the beautiful Montana skies and landscapes out every other window in my house. I don't get out into the woods as much as I should these days but I think I will try to go more in the next few months. It is inspirational to walk among wildflowers, Ponderosa Pine trees, and huckleberry bushes and enjoy the sounds of birds in the trees. Getting some exercise would be a good thing too! Having a passion that is basically sedentary doesn't do much for the figure. And I have a 30th reunion coming up soon so I guess I better get started now!! After opening two shows this month and with all the cloudy, rainy weather we've been having, I'm having a difficult time getting myself back into the swing of creating. I have two more shows coming up in August and September so I need to create some new works for those. I did just complete a challenge quilt for the Pacific West Quilt Show in Tacoma and tonight I finished my postcard challenge piece for our local Bitterroot Quilt Guild's show next weekend. Now I'm ready to start a new piece. But here I sit on the computer not in my studio! I sold two small pieces at the opening reception of my show at Art City in Hamilton. Here are pics of the two pieces. They were both small but lovely little works and I will miss them, as I do many of my quilts when they go! In The Pines - The pine branches on the bottom and right are threadpainted over a stamped image and the one on the left (in the detail above) were created free-hand. In April the Art City Gallery had a "Recycled Art Show" and in the spirit of recycling our project for the Tarts class was to use plastic shopping bags to create a sort of "fabric". You layer 3-5 layers of plastic bags and fuse them together with your iron between two applique pressing sheets. Then they can be cut up and used however you like and there were quite a number of unique uses. 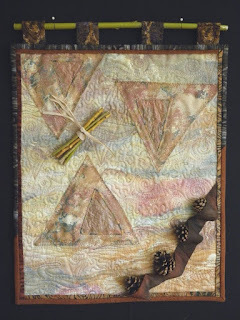 I just used mine as fabric and then chose complimentary fabrics and found items to create three fiber art pieces. The embellishments and most of the fabric are all things that were given to me or found or from past projects. If I don't get back in my studio to create some new pieces, these may be in one of my next two shows! The art group I belong to has chosen a name: Montana Bricolage Artists (MBA). "Bricolage" (brēkō'lä zh) is defined as a construction or creation made from a diverse range of available things. We needed to finally commit to a name for the marketing of our first fiber art exhibition which is called The "Trunk" Show. The pieces are long narrow fiber works meant to portray tree trunks in any form, style, or techniques that the artists wished to use. We hope to hang as many of the pieces as possible suspended freely instead of against the wall so that you can have the experience of walking through the "forest" of trees. I have seen most of the finished works and I can tell you it is going to be a beautiful show. We are premiering this exhibition of approximately 25 pieces at Montana Art and Framing and the opening reception is June 10 from 5pm-9pm. The show will be there until the end of July. We will be seeking out other venues and hope to get it exhibited several more times in the next two years. 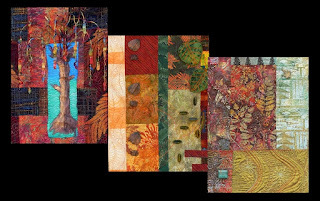 Tentatively it will be in Billings in the spring of 2012 at the same time that the Creative Forces exhibit is there which is a Studio Art Quilts Associates exhibition. I hope that if you are anywhere in the Missoula area in June and July you will stop by Montana Art and Framing at 709 Ronan Street in Missoula (406-541-7100) and see our show. I believe that you will find it an experience to remember. We are currently working on a postcard and will be designing some kind of poster/flier for marketing our show. We have a work session planned for later this month in order to prepare all the pieces for hanging at the gallery and finalize our reception plans. There are a lot of details to organize for an effort like this and we are all new to the process so we are hoping it goes smoothly. The best thing about it is the universal enthusiasm for the theme of trees. Particularly in this Rocky Mountain region in the midst of mountains, wilderness, and nature we are inspired by trees and fascinated by their endless variety, beauty and majesty. Also in June and July I will have my solo exhibition at Art City Gallery (407 W. Main St., Hamilton, MT) with an opening reception on June 3. 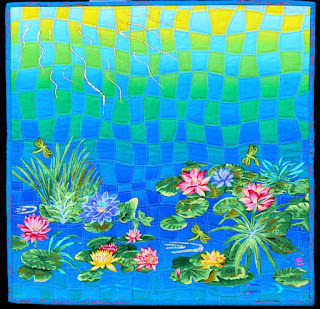 The show is entitled: Art Quilts: Images of Nature. I know, I know, rather trite, but it is what it is and I felt it a fitting title for my work. Here is my postcard image for that show to intrigue you into coming! I just received notice this week that one of my pieces, "A Twist of Lime, A Pinch of Purple" will be exhibited at the AQS Knoxville quilt show in Tennessee which is a new part of the country for me. I was pleasantly surprised for this quilt to be accepted to this large show. I have shown this piece a number of times and it can look very beautiful or rather unremarkable depending on how it is displayed. Let's hope it is hung well in Tennessee with nice lighting! The color in this quilt is very lovely and the unique setting of the log cabin blocks is interesting. I hope viewers enjoy it. I am waiting to hear from a few shows including the Pacific West Quilt Show in Tacoma and Larkin Van Horn's "Deep Spaces" exhibition. I'm currently working on a couple of new pieces for my Art City show and today I bravely cut many holes in one of them and am now backing them with contrasting fabric and satin stitching the edges. I think it will work nicely.